Every October I promise myself that I'll spend every free waking minute watching scary movies, and almost every October I end up watching The Body Snatcher and Doctor X and that's about it. This year I've been doing much better, and I've seen a lot more new-to-me thrillers than ever before. 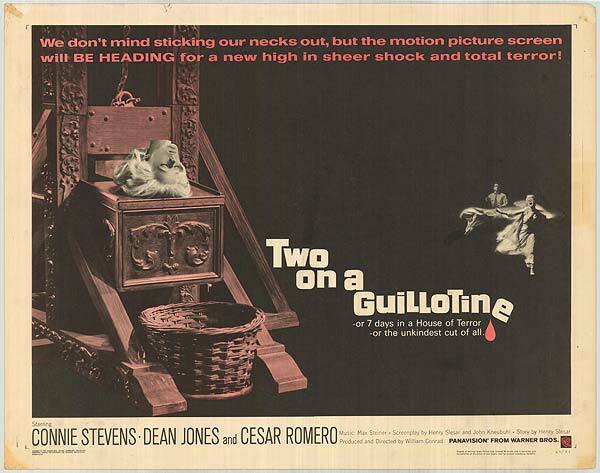 I think my favorite so far has been Two on a Guillotine, a spooky movie from 1965 starring Connie Stevens and Dean Jones. This really is That Darn Cat meets The Haunting. Connie Stevens' plays a young woman whose estranged magician father (played brilliantly by Cesar Romero) recently passed away. Dean Jones is an undercover reporter who cozies up to her to try to get the scoop on her mysterious father and his creepy promise to return from the grave. Stevens and Jones had a wonderful chemistry. I'd only ever seen Stevens in the campy melodrama Susan Slade, but here she seems to be having so much fun! Her interactions with Jones seem perfectly natural and there's an ease about her performance that you don't normally find in 60's horror movies. I feel like sometimes Dean Jones can be a little too much for me, but here his energetic personality, and the fast pace at which he spits out his dialogue, seem much less overwhelming. Perhaps it's because Connie Stevens exudes such a cool, calm air that she balances out his energy... or perhaps it's because his neurotic spirit is a welcome respite in a film that takes place in a (potentially) haunted mansion. The movie fluctuates between romance and horror quite seamlessly. Witty banter is found side-by-side with strange wails emanating from the basement. But here's the thing -- normally movies that play light with horror tend to be devoid of any actual scares. But this movie has scenes that rival The Haunting in palpable tension and bone-chilling fright. I was actually clutching my blanket in fear a few times, and I'm pretty sure that I might have screamed at the same time as Connie Stevens in one particular scene. Overall this had a wonderful mix of light and dark, sinister sounds and 60's dance music, romantic tension and edge-of-your-seat thrills. I enjoyed this movie immensely and I think it'll join The Body Snatcher and Doctor X as a film that I return to every October. It's available to watch instantly on Amazon here.